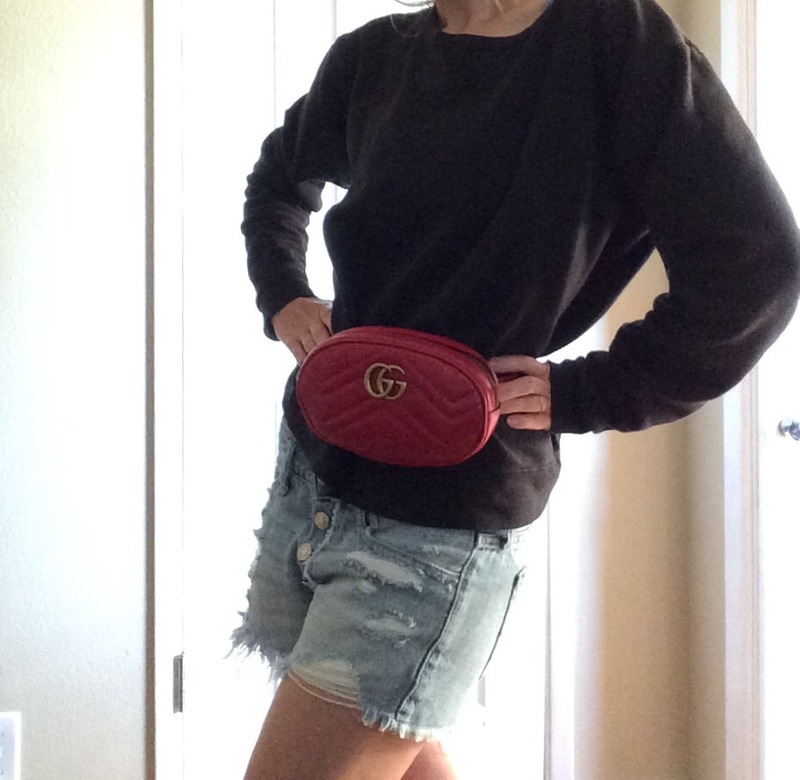 It’s a fanny pack. 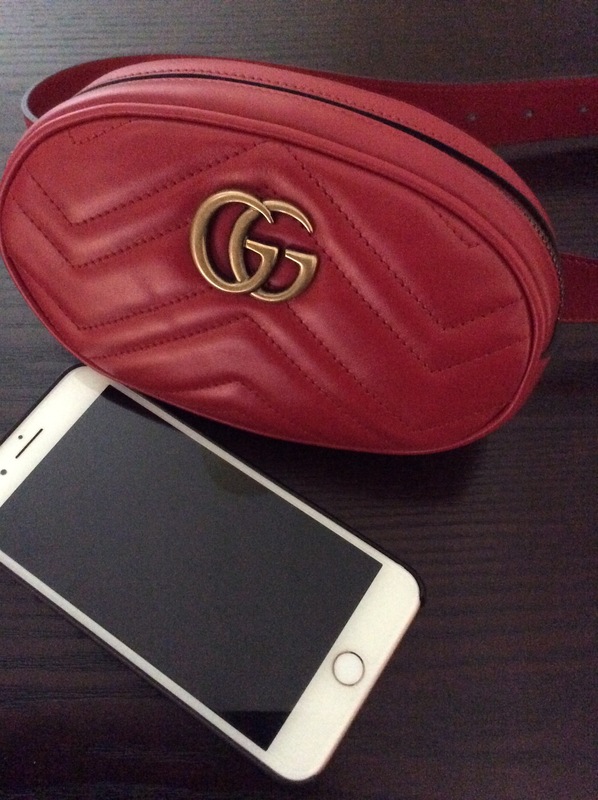 I didn’t exactly want a fanny pack…oh, I’m sorry “belt bag”, but I did want another hands free bag and I THOUGHT I had the perfect solution with the Gucci Marmont belt bag. Side note: I plan on doing a YouTube video on this bag sometime within the week when it’s more convenient. Because the plan was to wear the bag crossbody style. My mistake (huge mistake) was ordering the bag in the smallest size. I should have called the 800 number and asked for assistance in sizing, but I’m so accustom to being small. I made the assumption that the small size would fit crossbody on a small person, no such luck. For reference: I’m 5’2″ tall, weigh 98 (ok, technically 97.6) pounds, with a natural waist of 22.5″ (I’m guessing around 24 or 25″ in the sweatshirt). 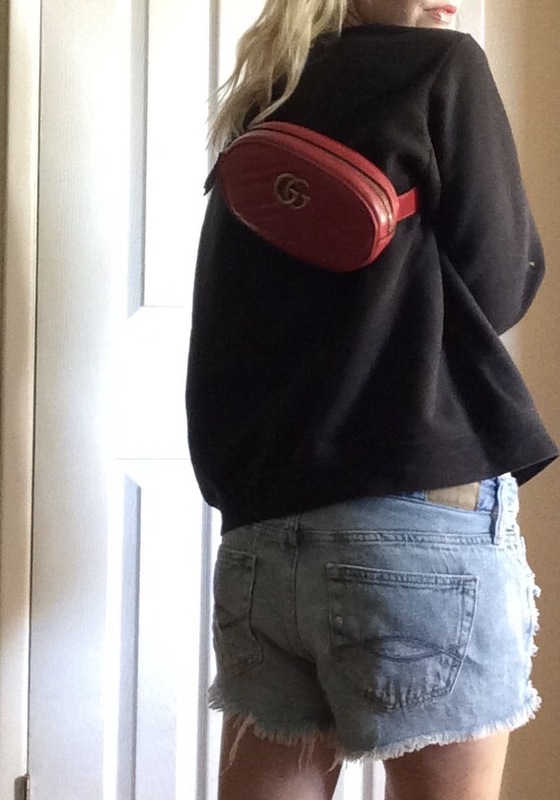 Crossbody is not really an option unless wearing the bag at this height becomes a “thing”. It’s not really uncomfortable, it just looks weird. 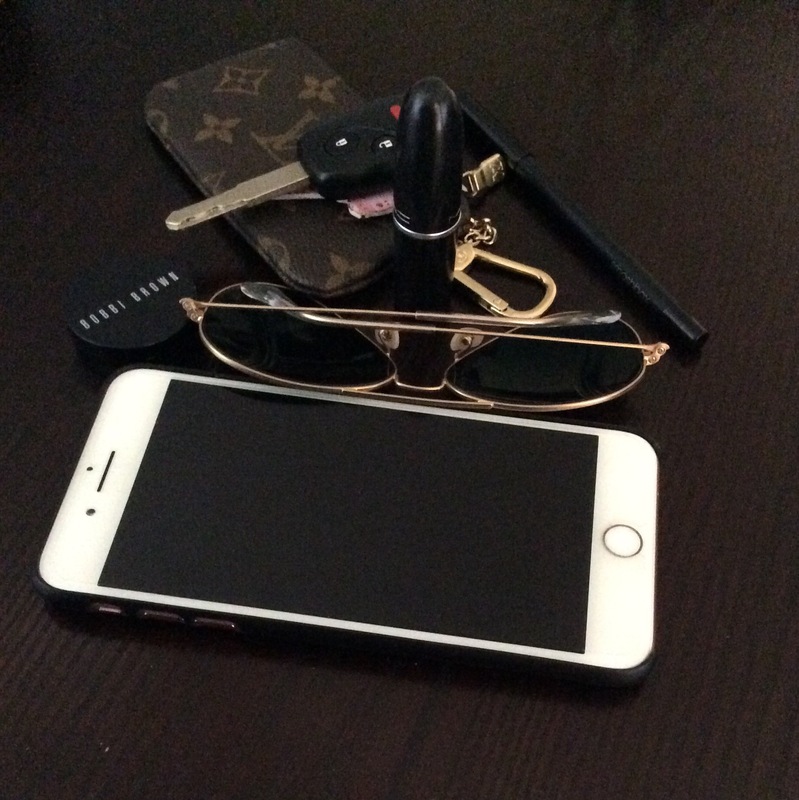 The iPhone 7 Plus in a very slim case, RayBan aviator sunglasses, my keys (no keychains), an eyeliner, one lip product, a Bobbi Brown corrector, and an LV key cles. That’s it. It’s stuffed. How I plan on using this bag this week: for the most part I plan on using it as a bag within a bag for the next four days. In the gym bag in for the morning then take it out and use it alone on walks with my daughter. In my Speedy or Neverfull along with all my computer stuff for two days of work and then again take it out for trips around town with my baby girl. After that…I’m not really sure. I’m not sure this bag will make it into my regular rotation or end up being sold like my WOC. 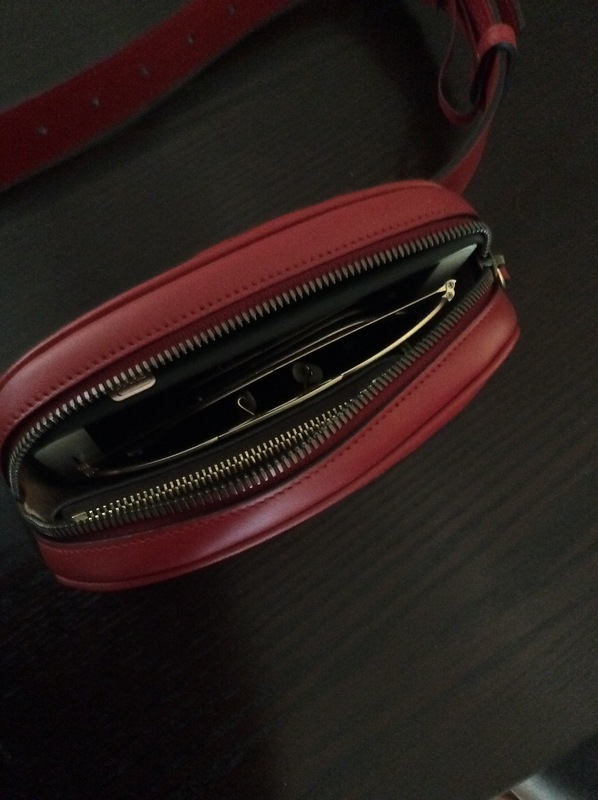 I guess I could try to return it for the larger size strap…but I’m not really much of a returner. I’ll have to think it over. I just hope my experience helps someone else. It makes a nice pouch or clutch without the belt if that’s helpful. If you have any styling suggestions, please let me know. Until then, wish me luck. Looks like I’ll be sporting a fanny pack.